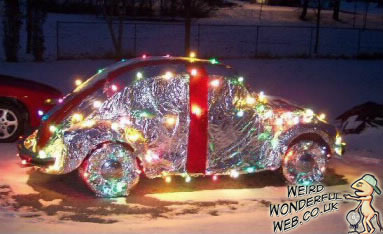 Weird Wonderful Web: Xmas decorated car to Beetle the rest! Another car decorated for Christmas for you. Even covered up, the Volkswagen Beetle's unmistakable shape is instantly recognisable. Someone has gone to great lengths here to cover the entire thing in tin foil. Even every wheel! Now we all assume this is purely for decoration, but what if there is someone inside it, worried that their tin foil hat wasn't strong enough on its own to keep the government from stealing their thoughts.